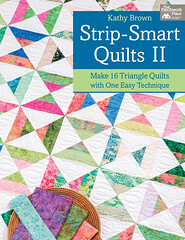 Hi there hoppers, welcome to my day on Kathy's Strip-Smart-Quilts II book tour! Holy cow I am following some tremendous people, far more entertaining than me! Like Carrie. Did you read her post? Yeah, you should do that. And then come back! Then there was Barb and Mary. More great reading, more great photos and another great block! Yesterday was Pat Sloan, she really went to town on the Mall quilt block! Lots of great in progress pictures. Like everyone so far on the list, and like Pat, who will be on deck tomorrow, one thing we share is our friendship with Kathy and our admiration of work! This is Kathy's second Strip Smart book, and I was lucky enough to make a quilt in the first book, so I'm familiar with that really cool ruler. It's hard to pick a favorite quilt in the book, I'm drawn to all brightly colored quilts. The photography and staged shots are really so nice. I also really like reading the inspiration behind the quilt, particularly The Mall, pictured below. 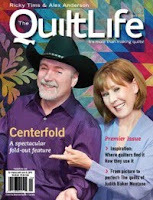 Kathy shares lots of anecdotes along the way, and I think it makes the quilts even more special. Of course the instructions are wonderful, Kathy knocks it out of the park. Like everyone else, I had to get out some fabric and get reacquainted with that ruler! I happen to have some fabric laying around! I cut my strips and got started on a block from Calm Before the Storm. Kathy's instructions had me back in business in no time! Kathy is awarding a grand prize, so be sure and leave a comment here for a chance to win! I've already won, I have a great friend in Kathy!! I like your incorrect center! I love your Red white and blue block, it is always a great combo I'm my opinion. I would love to win the book and ruler. My next quilt is The First Ladies. I think this ruler would be a grand help in cutting. Great block. This book sounds really useful and I like everything I have seen from it so far. Wow! That is one crazy-looking ruler, but it looks like it really helps make some beautiful blocks! Incorrect center? I don't see any problems. Oh... forgot I'm riding along on my horse at 300 feet - can't see any problems at all! Looks like another fun book to add to the collection. I love this ruler. 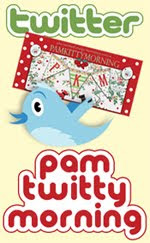 have a great day Pam and stay warm. I like your quilt block. The book looks like it has lots of nice patterns. I love your block. It's not incorrect, you just made a design change! I don't have that ruler....yet... it looks like a great one to add. 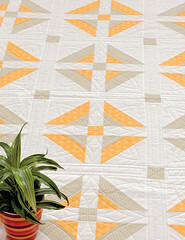 A simple block that leads to a striking quilt! I love it! Will have to look for the book and check it out! 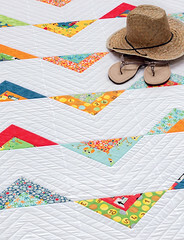 Been following all the blog posts this week--all the quilts and blocks look wonderful. Would love to make a quilt with this technique. Ah, what a great friend to say you have a great friend. Thanks for the chance to win. Love you color choices. All the others have look great too - a very nice block! I am working on some square table covers for gifts for the holiday season. This book looks like a great resource and the ruler sounds exciting. This looks like such a fun book and ruler! 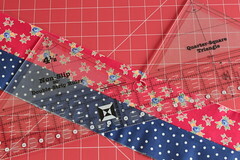 Both the book and ruler look like a great opportunity for some sewing funtime. What do you mean incorrect center? Your block looks great. IMHO an artist can change, alter, omit anything they want. Follow your muse! Lovely block! I don't see anything wrong with the block. It looks fine to me! I would never have noticed either. Looks lovely. Thanks for the chance to win. You are right it is hard to pick a favorite from what I have seen of this book they are all GREAT! Love your block. I could really use this book and ruler. Thank you for the chance to win. Really like the colors you chose for your block. Would love to win this new book and ruler. Thank you for participating! I saw that ruler a couple years ago and was fascinated. It's time to give it a try! Great technique - it appears to be relatively easy yet gives difficult-looking results. One cannot have too many rulers! I really love all the blocks shown so far in the blog hop. I really like the one you've made, even with that incorrect center. I like it. It's not incorrect, it's a variation! I had to look twice to figure out what was wrong. It looks like a great ruler and book. Cute Block! Thank you for the opportunity! This little book hop is so much fun. 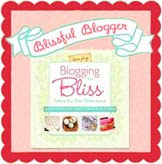 I love getting to know new bloggers & see what they are up to. Thanks for sharing your block - it's lovely. I love Kathy's patterns, and this book looks like a winner! Thanks! Love your colour choice and block. I can't see any incorrection,... Anyway, would that not make it a special SPECIALpam Quilt...? 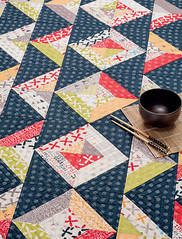 A few weeks ago on my regular patch by hand bee, i had one of these mornings doing silly 'wrong' things, like patching a triangle instaed of an quarter... One of my beefriends came up with the idea of just putting an other triangle to it and tadah... My square! Brilliant,! She added: this will bee your very own special quilt now... That's what i like about patching and quilting... Trying to be perfect and then .... Let it go... Its life on its own.. Even more alive! I am totally intrigued by this technique. Thanks for the chance to win. I love your block with the incorrect centre!! I would so love to win the ruler. Thanks for the chance. 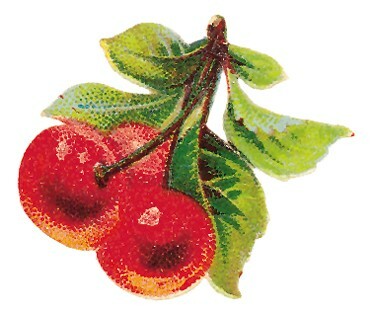 Thank you for a wonderful post! Kathy is visiting our guild in April. Can't wait to see her quilts and learn some of her techniques! Merry Christmas! Thanks for sharing the info about this book and ruler. There is no such thing as incorrect in quilting just originality I think your block looks just great. Looks like a great book! I would love to win a copy. I love your incorrect center--we all have them! Thanks for the chance to win some fun! Interesting ruler. I like easy! Love your block - incorrect or not! Book looks very fun! Your block looks fine and fun! Nice book and ruler. It took me a minute to figure out why your center was incorrect, but it looks fine in red! This looks like a must-have book and ruler. Thanks for the great preview. Lovely, I like your block! Great block! I am awaiting my PKPicnic. Love love the navy blues! Thank you for the chnace at the book and ruler. Looks like my kinda stuff! I will have to give this ruler a try. You can never have too much quilty stuff! It's fun to see how this ruler works. I never would have guessed that these blocks were strip pieced. I love the color and design combination in your block. Thanks for sharing! Nice blocks. Would love to win. Thanks for the giveaway. Love the idea of a ruler that cuts three triangles at once. Thanks for the giveaway. Very pretty, I like the red, white and blue, thanks for the giveaway. I don't have a problem with your centre. I call myself the imperfect quilter because I want to enjoy the process more than sweat about perfection. I am going to have to get one of the rulers and have a go at it. Love the patterns I've seen so far. Love the quilts you have shown from the book. So clean and crisp! Thank you for the chance to win! I love your block and would love to win the book and make the Flip Flop quilt. Thanks for hosting the give-a-way. I love your block! That ruler looks like it would be fun to use. Thanks for hosting the giveaway. I like the fabrics in your block and the book looks great. Thanks for the giveaway. Friends are awesome =) Love the block, looks great from here! Looks like a great book to have in one's quilting library! Love your block, the fabrics are fun. Like to try this ruler and the patterns in the book! I think your block is just perfect the way it is!! It sure looks like a great book! I loooove your block!! Don't be so hard on yourself!! You did great job!! The Book & Ruler are amazing!! What kind comments you gave to Kathy! I can tell you have a special friendship. Looks like a great book and ruler. Thanks for the chance to win. Love your block and the colors you used. The center is not an error, it's a variation. Thank you for the chance to win the book and ruler. Looks like it would be a lot of fun. I LOVE the "mistake". In fact, I have the book checked out from the library and I think I like your version better! I love your block and I don't think you have the centre wrong, it's everyone else that's doing it wrong! I'm really intrigued with this book and ruler. It looks like so much fun. And your block looks great just the way it is. Thank you for a chance to win. 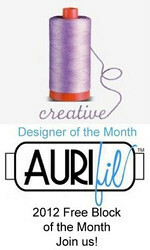 This ruler looks wonderful from everything I've seen on this blog hop. I've already put it on my wish list for Santa this year but if I'm lucky enough to win one, I can put something else on my wish list. 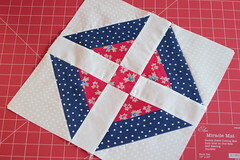 What a great red/white/blue block - I see a quilt of valor quilt with this! I love how this book and ruler make such wonderful quilts so easily. This is one of the strangest looking rulers ever! But look at those marvelous quilts. My favorite is Flip Flops. Lately, I've been drawn to quilts with lots of white. This is such an odd looking ruler. It makes quilters look like we are holders of some arcane knowledge that the common folk can only guess at! Looks like a fun book and love your block. We all make incorrect blocks at times. I think this ruler is pretty cool. Love the blocks it can make. Thanks for the giveaway. I like your "incorrect" center, too. Pam, I really like your creative interpretation... Your artist's prerogative to change whatever you wish!! I love the blocks made from this book and ruler. Your block looks fine to me. Yes I also have fabric laying around. This ruler looks kinda handy, would love to try it. Thanks. Love your block! I'm glad I'm not the only one who errs. Great block! And I never would have known the middle was wrong if you hadn't said it was. It looks pretty darn good to me. That's a very interesting ruler! I'd love to try it out. what a pleasure it would be to meet Kathy! All of her friends are raving over her on these blog posts! 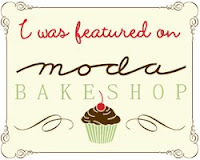 I've been enjoying this blog hop. I'm also having trouble picking out what is incorrect about your center. Love your blog. The Mall is calling me - the quilt not the building! Kathy's book and ruler. I think I would have tons of fun with it! Oh my I'm so excited about this giveaway! I've been wanting to play with this ruler for a long time! The book and fabric are just a plus! 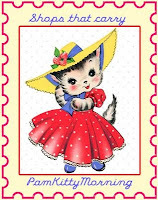 And I'm posting on Pam Kitty Morning's blog. What could be better? Such CUTE fabric! Thanks! Love the idea of this ruler. It looks like it would be so much fun to work with! Her books and rulers are on my wishlist! LOVE THEM!